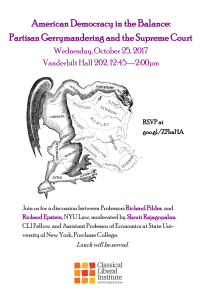 Please join us for a lunchtime discussion between Rick Pildes, Sudler Family Professor of Constitutional Law, NYU Law, and Richard Epstein, Laurence A. Tisch Professor of Law, NYU Law, on the constitutionality of partisan gerrymandering. The conversation will be moderated by, Shruti Rajagopalan, CLI Fellow, and Assistant Professor of Economics at State University of New York, Purchase College. The most important case involving the constitutionality of partisan gerrymandering, Gill v. Whitford, was recently argued before the United States Supreme Court. Should the Supreme Court hold partisan gerrymandering unconstitutional? Is the Court likely to do so? What would the consequences be if the Court were to hold partisan gerrymandering unconstitutional? And how much does partisan gerrymandering affect the nature of American democracy today? These are among the questions we will debate in this session, which will relate the case to the complex history of redistricting in the United States Supreme Court , most notably Baker v. Carr (1962). Lunch will be served. The event is open to members of the NYU community.